Shrewsbury and Telford Hospital NHS Trust have designated car parking facilities for patients and visitors. Our hospitals are very busy, so please allow plenty of time before your appointment to park. Please be aware car parking charges changed on 1st November. For more information please view our news item. Payment is on exit at one of the one-site machines located in the exits of the hospital. Patients and Visitors can pay by cash, debit and credit card. Please note that the machines do not give change but we do have change machines located near to the payment machines. Payment can also be made on-line up to midnight on the day of the visit to the hospital site by logging on to SaTH Parking. Input three consecutive digits from your registration number. The machine will display an image of your vehicle and ask you to confirm it is yours. It will then calculate the payment required based upon the time you have been on site. The pay machines do not give change. They accept 10p, 20p, 50p, £1.00 and £2.00 coins. If you are making multiple visits to the same hospital during a 24-hour period you have the option of selecting “daily rate” and you will pay no more than £8.00 for that day, rather than paying the “hourly rate” each time you attend. Please note that this period begins and ends at 12am, not 24 hours from when you arrive. Staying over a long period? If you have stayed for over 24 hours or have left a vehicle at one of our sites for a longer period of time (this may be the case if a patient is transferred from one site to another), then please speak to a member of staff. Our car parking team have a “whitelist” to ensure that vehicles where this is the case don’t get fined. Please note that the car has to be added to the list within 48 hours of arrival, so please speak to a member of staff about this as soon as possible. If you are a holder of a blue registered disabled badge there are designated spaces at various locations around the hospital sites. You are still required to pay for your period of parking on exit, but you may be eligible for full or partial reimbursement of your travel costs. Please visit our Help With Travel Costs page for more information. Remember to display your blue badge wherever you park. The car parks are managed on our behalf by CP Plus. Please talk to the CP Plus Attendants if you have difficulties with parking, who will be only too pleased to help. The car parks are patrolled by attendants from 7.00 am to 7.00 pm Monday to Friday and 10.00 am to 4.00 pm Saturday and Sunday. They will assist you if you experience difficulties with the pay machines, finding your way into the hospital, helping to find assistance if your car should breakdown whilst in the car park and finding an available parking space. Dedicated drop-off and pick-up parking spaces are provided outside the main entrances at the hospitals for your convenience, though the system allows for any space to be used for this purpose. Some people are eligible for full or partial refund of their hospital travel/parking costs. Please visit our Help With Travel Costs page for more information. All vehicles must be parked within the marked bays only. No parking on double yellow lines or yellow cross-hatched boxes. Only holders of a blue registered disabled badge are allowed to park in the designated disabled parking spaces. They must display their blue badge and are still required to pay on exit. Any vehicle parked on the Trust’s sites that causes an obstruction for emergency vehicles risks being damaged and will be issued with a Parking Charge Notice. The owner of any vehicle that causes damage to Trust property will be liable for the full cost of repair/reinstatement of the damaged property. Anyone who parks in breach of the rules is liable to be issued, without warning, with a Parking Charge Notice by CP Plus on behalf of the Trust. A Parking Charge Notice is £40.00 and is reduced to £15.00 if payment is made within 14 days. This information was correct at time of publication. Please refer to pay machines and signage as well as information from Wards and Departments for further details. Our car parking arrangements have been developed in the context of good practice guidance published by the Department of Health – “Health Technical Memorandum 07-03 NHS car parking management: environment and sustainability. 2015 edition”. If you have any comments you would like to make about the car parking service you can do so by downloading our complaints and compliments form. Copies of the form are also available on request from the car park kiosks at both sites and can be returned to the Patient Advice and Liaison Service (PALS) at either hospital. The Trust cannot accept responsibility for vehicles parked on its sites. Vehicles are parked at the owners’ risk. From 1 December 2016, the Trust will operate an exclusion zone whereby new starters who reside within a one mile radius ‘as the crow flies’ of their hospital base are not automatically entitled to a permit to park. 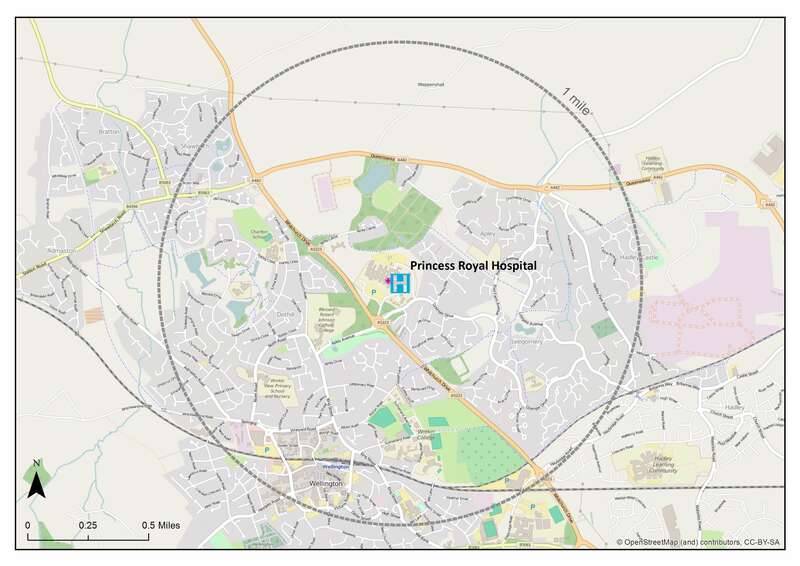 The exclusion zone is currently set at a one mile radius of each hospital site, but the Trust will review this from time to time and may adjust this distance. 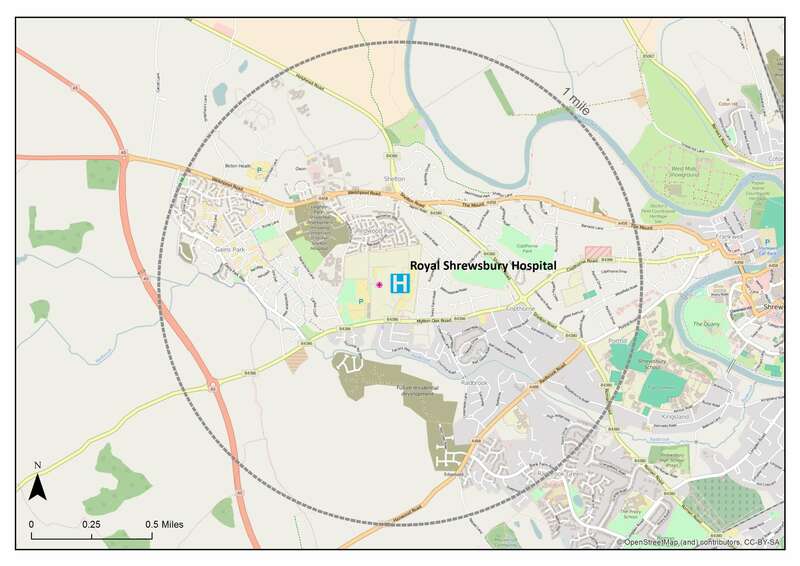 For finer detail, please see our exclusion zone maps for The Princess Royal Hospital or Royal Shrewsbury Hospital. The Trust advocates active and sustainable travel modes. The Trusts Policy for Staff Car Parking (W20) can be found on the Trust’s intranet policy page. Upon applying for a parking permit, a staff member will be prompted to declare whether they reside within the exclusion zone. There may be certain circumstances that can be taken into consideration.